While Batman and Joker were the kings of the summer box office, the queens of the small screen in 2008 were Disney's The Cheetah Girls whose third Disney Channel Original Movie drew in the most viewers, "second only to the 2008 Summer Olympics." In a delightful and feisty blind of color, flair, music, dance and more than a little girl-- er, I mean Cheetah--power, Chanel (Adrienne Bailon), Dorinda (Sabrina Bryan) and Aquantetta (Kiely Williams) attempt to earn one last chance at stardom before venturing off to college in the fall. While Aqua spends her time purposely messing with her computer so she can call tech support to flirt "with the nerd patrol," a.k.a. Kevin at extension 347 and Dorinda vows to stay busy to overcome a heartbreak by teaching dance, Chanel tries to be the glue keeping the girls together. Not willing to give up on the Cheetah dream after yet another failed audition-- the three venture off for a New York City night of Indian food and thanks to a sympathetic waitress, a little magic and a statue of Ganesh, soon the three land a part in a young filmmaker's first Bollywood movie. Boldly journeying off to Mumbai, the girls find romance and adventure as Chanel catches the eye of their handsome director Vik, Aqua manages to get closer to Kevin 347 and Dorinda discovers that the best way to move away from the end of a relationship is to help others on their own path to love. Frothy, forgettable, yet fittingly fun-- I was pleasantly surprised by the quality of this made for Disney ode to the fighting female spirit which began back in 2003 when the first Cheetah movie (based on Deborah Gregory's award-winning and bestselling book series) became that particular year's "highest rated movie on broadcast or cable among kids 6-11... and 9-14." A sucker for anything Bollywood-- like many my age who are roughly twice the target demographic, I first discovered Cheetah power when the talented dancer Sabrina Bryan participated in ABC's smash reality series, Dancing With the Stars. And as someone who still feels that Bryan and Spice Girls star Mel B. were the two most naturally talented female performers on the show, it seemed only fitting to check out the Disney version of Baby Spice, if you'll forgive the pun. Making its way to Disney DVD and Blu-ray in a stunning transfer-- the quality of the Blu-ray disc falters a bit at the beginning with the dark and grainy New York City night sky but soon becomes crystal clear with the vivacious Indian scenery, colorful costumes, and high-energy musical sequences. 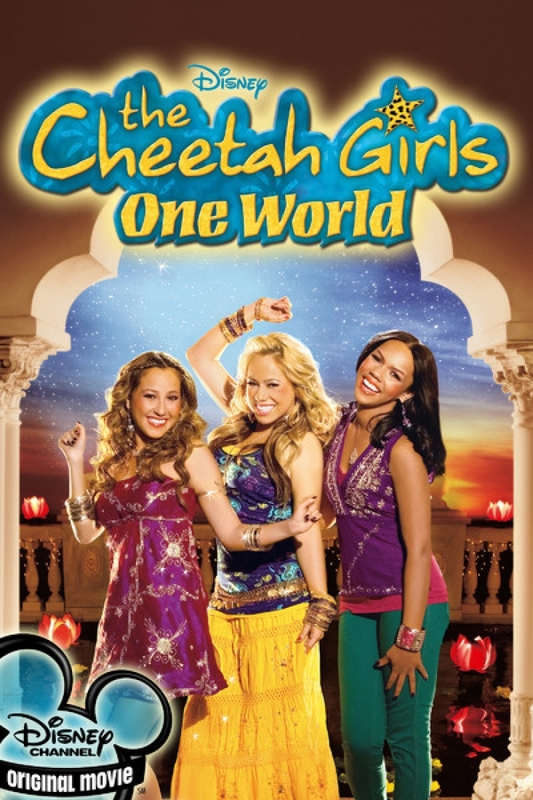 While admittedly it did seem strange that Disney's Cheetah Girls would go from the TV format directly to Blu-ray, soon we realize that-- having pulled out all of the stops in director Paul Hoen's production (which was filmed in India)-- it's only fitting that it's given the royal treatment with the vivid celebration of the "one world" message and movie's exploration of another culture and musical filmmaking. And granted, of course, it's fairly easy to predict, pleasantly the girls never overstay their welcome in World's fairly brief eighty-eight minute running time. Featuring Bollywood-style glitter tattoos, on-set bloopers, extended musical numbers and videos including the never-before-seen musical sequence "Feels Like Love," fans also have the opportunity to view it in Rock Along mode or watch the film with the "Cheetah Spots" feature which offers pop-up video fun facts. With Disney's reputation for stellar quality in vastly improving on the technology of their work as evidenced in their amazing Blu-ray ad campaign that precedes every single feature I've seen from the studio for months, viewers with older Blu-ray players should be warned that the disc is state-of-the-art. To this end, a warning message loads upon initial insertion of the disc, letting you know it could take a few minutes to begin playing, depending on the compatibility and age of your player (as additional firmware could be required) but I had no trouble moving directly past the opening ads and landing right on the brightly colored, although slightly tricky to navigate menu which felt and sounded like a video game. Boasting a positive message that encourages friendship and loyalty among the girls who put each other first before ambition, boys, and their own egos-- the girls offer their fans a refreshing mini pop princess trio that feels far more wholesome than some of Disney's other "graduates" such as Mousketeer Britney Spears and Disney child star Lindsay Lohan. With incredible sound quality that turns your family room into a Cheetah concert-- one minor flaw that is especially noticeable given the incredible transfer to Blu-ray is that every once in awhile the sound and the girls' mouths don't match up in the lip-synced music sequences. While of course, the perfect sounds of the studio recorded music seem out of place as the girls burst into song at a restaurant and turn the entire place into a dance club within seconds, it's easily forgiven when you're knocked out by the amount of hard work that went into the production from the international shoot (which puts other made-for-cable movies to shame) and impressive choreography. However, for parents, perhaps its greatest success will be ensuring that even children with the shortest attention spans imaginable will find themselves drawn into the rhythm introduced by Chanel, Dorinda, and Aquanetta as those Cheetah Girls start to growl. Just don't be surprised if they start asking you to rent them some Bollywood classics!